Rosary for Aboirsto E. “Joe” Barrientos 79, of Lubbock will be held 7:00 p.m. Monday, October 22, 2018 at Calvillo Funeral Home Chapel. A Funeral mass will be celebrated for Mr. Barrientos at 1:00 p.m., Tuesday, October 23, 2018 at St. Patrick Catholic Church with Father Joseph Thanavelil officiating. Burial will follow at Peaceful Gardens Memorial Park under the direction of Calvillo Funeral Home. 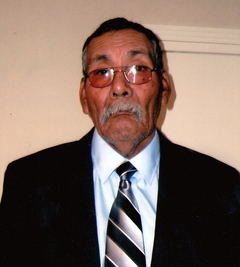 Joe was born October 28, 1938 in Posey to the late Jesus and Solidad Barrientos, he passed away on October 19, 2018 in Lubbock. On January 12, 1964 he married Isabel Pena Our Lady of Guadalupe Catholic Church in Seguin. Joe was a hardworking man and worked in the automotive field as a body shop technician. He worked for several automotive shops including David and Cindy Brown’s Western Collision and Keystone Automotive, but most of all he enjoyed restoring cars. He is survived by his wife Isabel Barrientos; sons John (Melanie) Barrientos of Levelland, Joey (Patricia) Barrientos of Lubbock; brothers; Guadalupe Barrientos and Johnny Barrientos both of Lubbock; sisters, Mary Ruiz and Connie Gauna both of Lubbock; eight grandchildren John “J.R.” Barrientos Jr., Cayla Pruitt, Anthony Barrientos, Christopher Messenger, Kathryn Barrientos, Amber Barrientos, Lily Barrientos and Gabriel Barrientos; three great grandchildren Jessi Pruitt, Morgan Pruitt and Lane Pruitt. He is preceded in death by his parents; brothers Santos Barrientos and Miguel Barrientos.